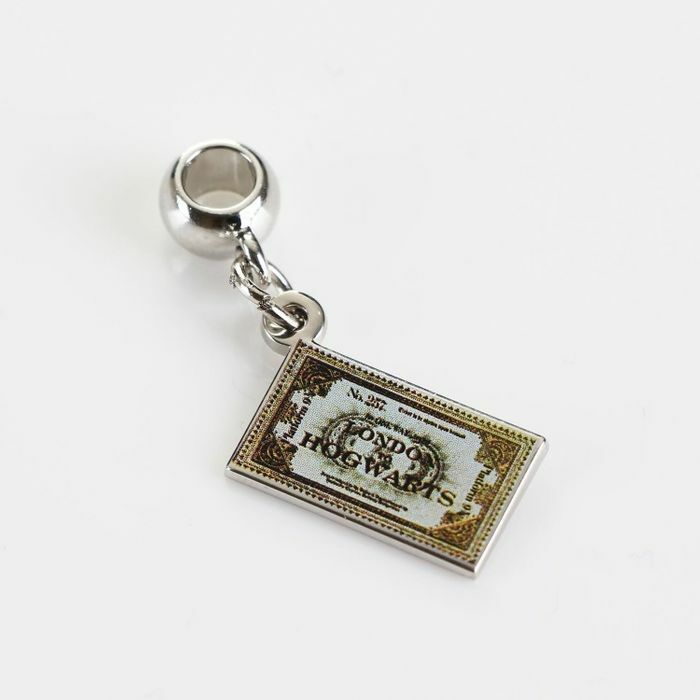 Experience the magic of Harry Potter with this Hogwarts Express Ticket Slider Charm. The Hogwarts Express is an absolutely iconic part of the Harry Potter franchise and now you can celebrate its legacy! It is perfect for any Harry Potter fans who are looking to expand their collection of memorabilia or start a collection. That could be family, friends, or yourself! This charm has a silver plated slider, where it attaches to the charm bracelet or necklace of your choice. The centrepiece of this charm is an accurate depiction of a ticket for the Hogwarts Express, and it attaches to a silver plated slider, where it can attach to a charm bracelet or necklace. This beautiful charm is the perfect addition to any charm bracelet or necklace; it can slide onto yhe black leather bracelet, silver charm bracelet, or silver charm necklace. You are given complete control over which charms you want on your jewellery, the choice is up to you! Collect them all and be the envy of your friends! Bracelet and necklace sold separately. This item comes with official Harry Potter branded packaging.